The heritage Darjeeling Himalayan Railways will resume the toy train services from December from Siliguri. North-East Frontier Railway Divisional Railway Manager AK Sharma said that work remained pending along a small stretch between the two destinations and expected to be completed shortly. It has been three years since the DHR had suspended services depriving tourists of the joyride through the picturesque terrains from Siliguri to Darjeeling hilltop. "We hope to wrap up the repair work between Mahanadi and Ghayabari by the end of the year," Sharma said. Huge landslides in the Tindharay and Paglajhora areas had forced the DHR to suspend services in 2011. 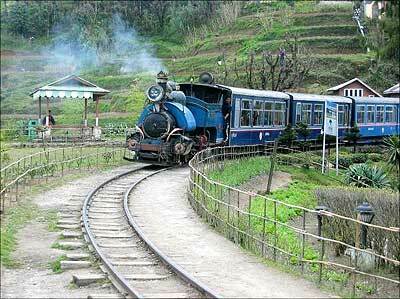 The Darjeeling toy train first began running in 1881 when Sir Ashley Eden was the Lieutenant Governor of Bengal. The DHR comes under the UNESCO's world heritage sites and covers a route spanning 87km. Darjeeling MP S S Ahluwalia had recently raised the issue before Railway Minister Sadananda Gowda and also intimated Chief Minister Mamata Banerjee. Sharma said along with the Railways, the National Highway Authority of India and PWD, West Bengal were involved in the repair work. The issue of repairing NH 55 was recently taken up by Gorkhaland Territorial Administration Chief Executive Bimal Gurung with the Union Road Transport Ministry.